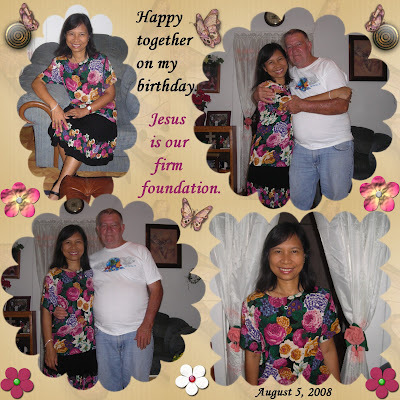 I celebrated my birthday today with just me and my hubby. We didn't go anywhere. We just ate at the house because I cooked meatloaf, pancit and lumpia. It's a simple celebration but I'm happy and contented. 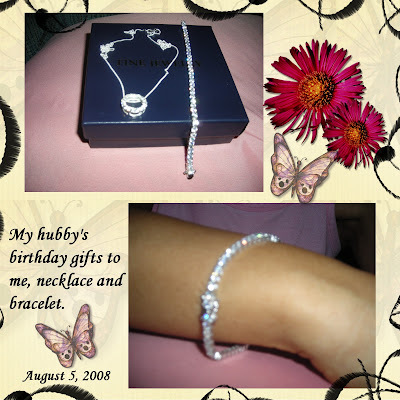 As early as yesterday, my hubby gave me my birthday presents, a matching silver necklace and bracelet with crystal stones that glitter like diamonds. They are so pretty and I like them. 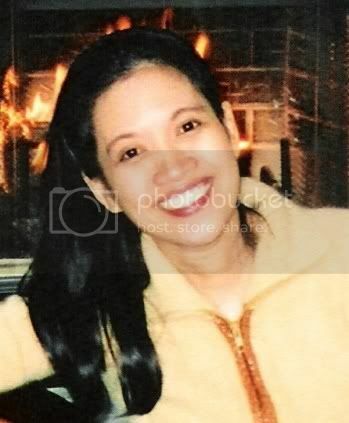 Before my birthday, I told my hubby that I'm not requesting any particular gift like I used to. I told him it's up to him what he wants to give me. So I was surprised when he gave me the jewelries yesterday. I hugged and kissed him. He asked me if I like his gifts. Of course I do like it. Hubby knows that I love jewelries. But my hubby is the best gift that God has given me. I won't trade him for anything else. I thank God for everything. I thank God for all the years that He has given me and I thank Him for my life. Without Him I won't be in this world. A belated birthday greetings to you! Wishing you more happy birthdays to come. Lovely blog very colored and pleasure to walk. Louisette passion golden retriever, corner blog likasi chilhood countrie borned, patpo aircraft..vertpomme,stationarypaper land..catsjovisca..tomjutte..